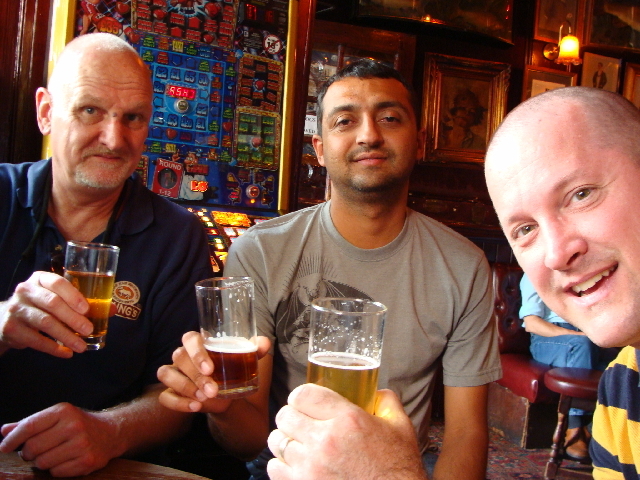 Owen Ogletree, Sachin Patel, Ed Hamrick and Jeff Rapp visited London in August of 2009 to cover the Great British Beer Festival. 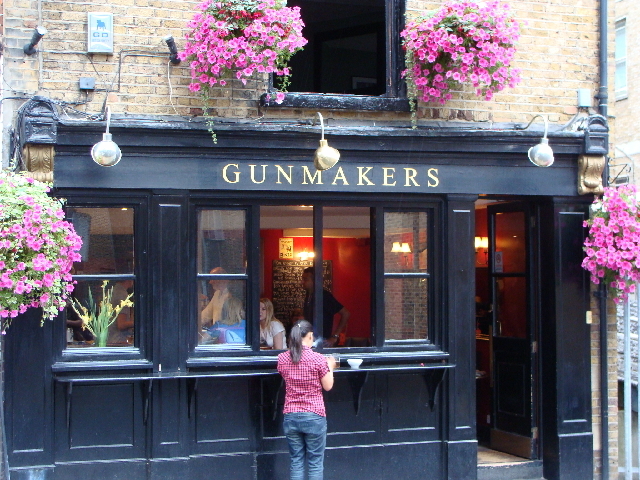 When not at the festival, we visited several of the best pubs in London (see the photos below). Anyone who fancies him/herself a lover of flavorful craft beer should be certain to seek out authentic, cask-conditioned, real ales in the UK's best pubs. A beer revolution is underway in the UK - with small breweries popping up all over - producing delicious examples of real ales packed with personality and elegant malt and hop flavors. Don't bother with UK pubs that do not sell cask real ale - stick to pubs that care enough about traditional UK ales to stock these delicate and subtle cask beers. 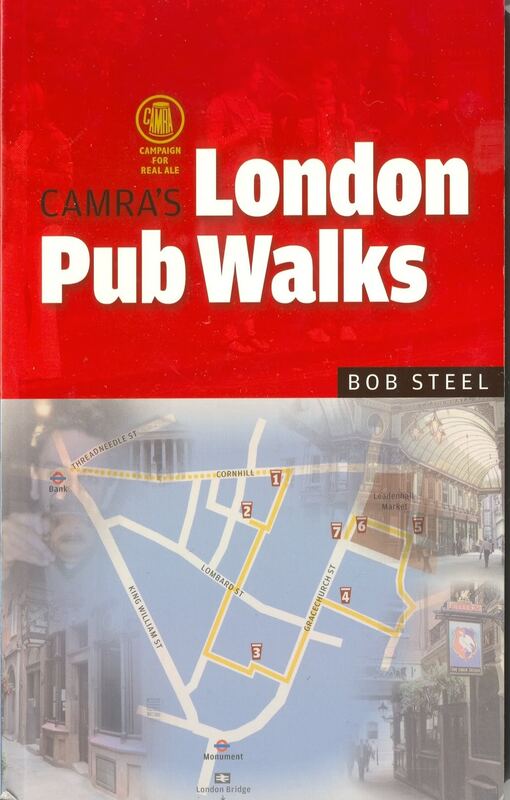 You may find these pubs listed in any of the fine guidebooks from the Campaign for Real Ale (CAMRA). See the link to their 2010 Good Beer Guide to the left or the two useful books shown at the bottom of this page. Of course, the best opportunity to sample a multitude of the UK's best real ales is the annual Great British Beer Festival - held each August at Earl's Court in London. Take a look at our tasting list and notes at the bottom of this page. CAMRA's Roger Protz describes the ingredients, tasting notes, and history of Rudgate Ruby Mild at a special tasting held at the 2009 Great British Beer Festival in London, UK. Rudgate Ruby Mild was chosen as the best beer of the festival by a panel of expert judges. 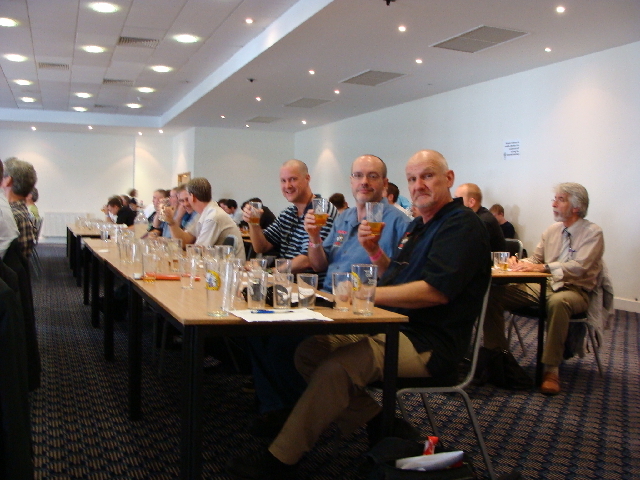 Attendees at the Great British Beer Festival wanting to learn more about the history, brewing and flavor profiles of classic UK real ale should be sure to purchase passes to the special tutored tastings offered each day at the festival. These tastings tend to sell out quickly. 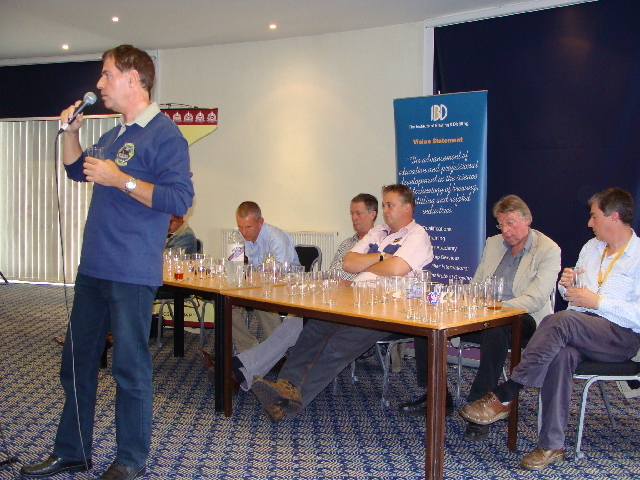 Above: Jeff, Owen and Ed sit in on the Champion Beers of Britain tasting hosted by Roger Protz. 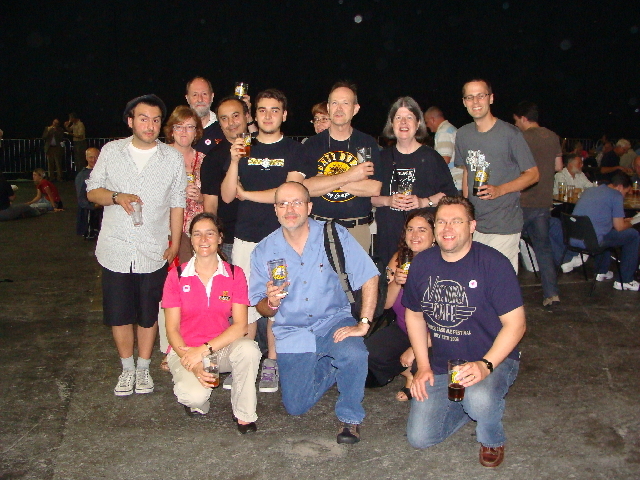 Owen Ogletree (center front) poses at the GBBF with pub owner friends he met on a recent pub outing to Toronto, Ontario. Owners of Victory Cafe and Volo pubs are pictured above, along with other friends. These Canadians are true fans of cask conditioned ales, and Victory Cafe even hosts a very popular cask ale festival at their pub each year - featuring only real ales from Ontario. - T.E.A. (Hogs Back Brewery) - A very characteristic, traditional English ale. - Clouded Yellow (St. Austell Brewery) - An interesting beer with wheat, coriander and cloves. 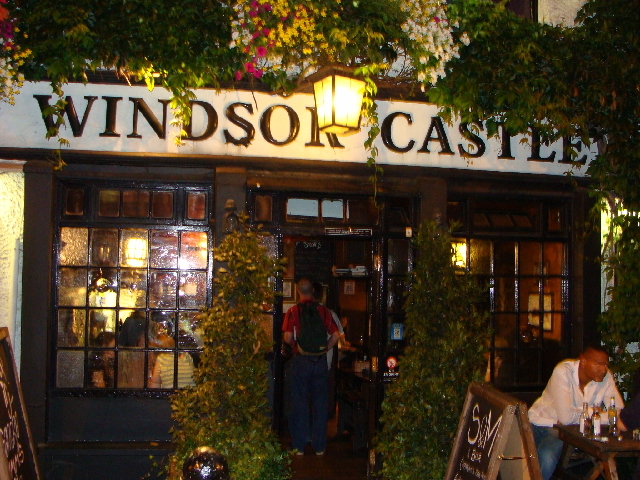 A traditional, UK-style ale yeast is used. - Summer Lightning (Hop Back Brewery) - 5% ABV single hop (E. Kent Goldings) ale with hints of lemon. - Fullers 1845 - 6.3% ABV with elegant crystal and amber malts and biscuity, raisiny flavors. - Empire Pale Ale (Burton Bridge Brewery) - 7.5% ale kept in casks for six months at 20-23 degrees C to simulate the sea voyage of a real IPA. Spicy, with clove and bubblegum hints - very complex and historic. - Titanic Stout (Titanic Brewery) - Roasty, biscuity stout with beautiful burnt flavors. Fuggles and Northdown hops provide a fresh, herbal hop flavor. A few years ago, Craig and his wife Karen took over this pub and turned it into a much-loved destination for lovers of real ale. 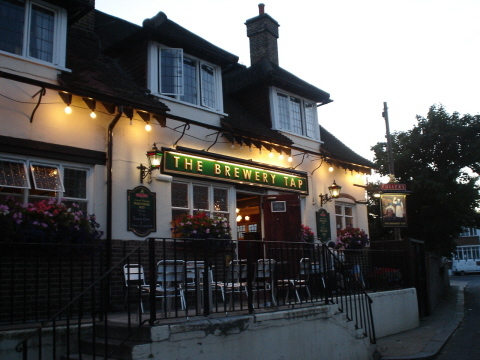 Voted CAMRA's 2009 North London Pub of the Year, the Bree Louise stocks four hand-pump casks in the main bar and a big selection of gravity-poured casks to the right of the main bar. Visit soon and order a dozen or so half pints for sampling. This is a modernized Young's pub with the full range of Wells/Youngs ales. Upscale gastro-pub food is available as well. 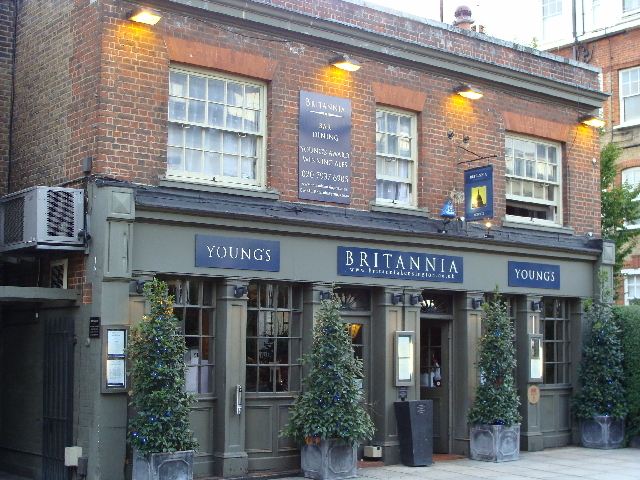 The Britannia serves as the ideal place to enjoy a fine meal alongside a pint of classic Youngs Bitter. 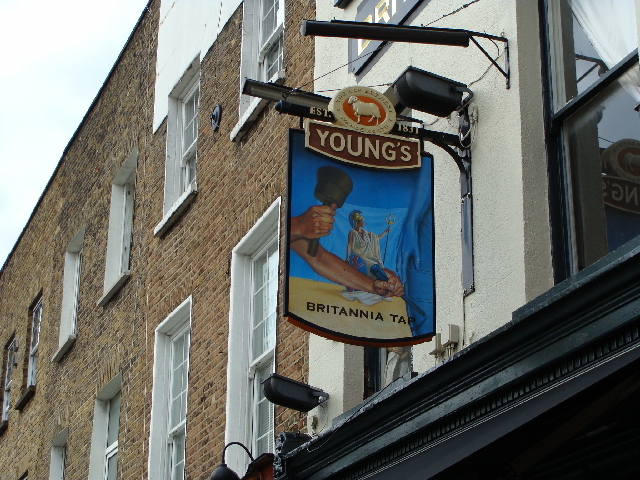 A friendly Young's pub just a short walk northwest of Earl's Court, Britannia Tap offers up fresh pints of Wells and Young's best cask ales. Dating back to 1667, this ancient pub drips with history - and the single real ale hand-pump flows with Sam Smith's Old Brewery Bitter. 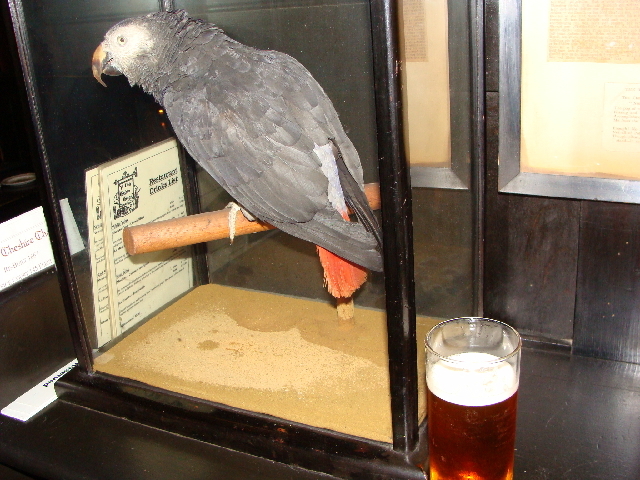 Pictured above is the stuffed remains of the old pub parrot - a much-loved pet well versed in profanity. This historic pub contains an eccentric blend of architecture and furnishing. 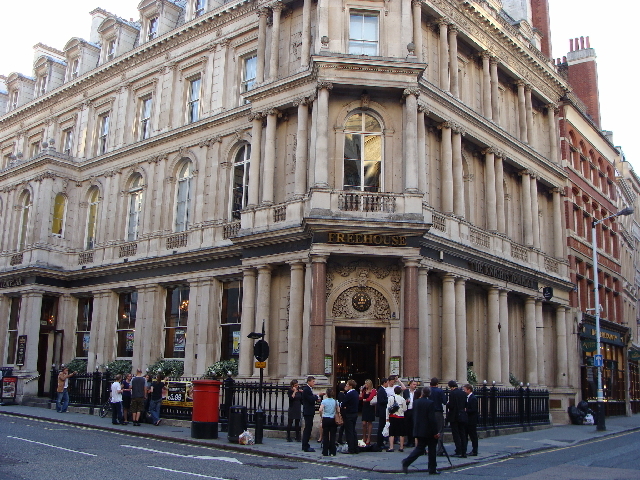 Another classic London pub owned by Samuel Smith's, Cittie offers only Sam Smith's Old Brewery Bitter on cask. Be sure to admire the beautiful old wood-fired stove in the center of the main pub room. 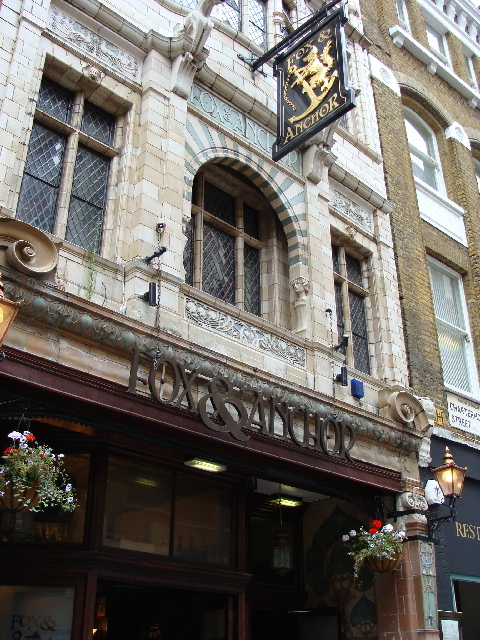 This central London pub stands within the frontage of the Savoy Hotel and serves a nice selection of cask ales usually including Fullers London Pride and Timothy Taylor Landlord. Be sure to sample the outstanding fish and chips and house-made meat pies. 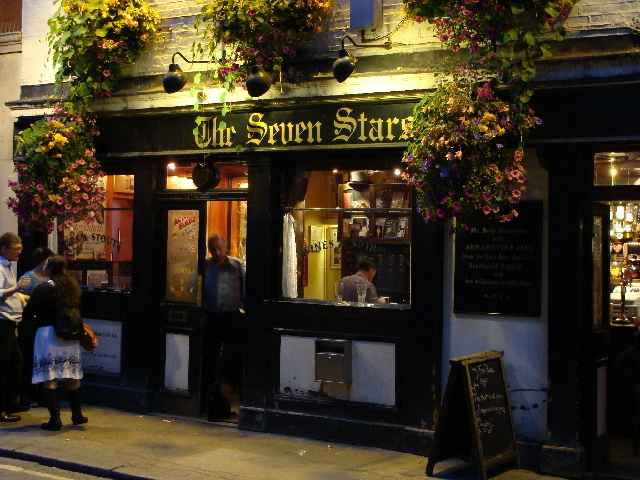 This pleasant pub offers real ales that are somewhat difficult to find in the city. 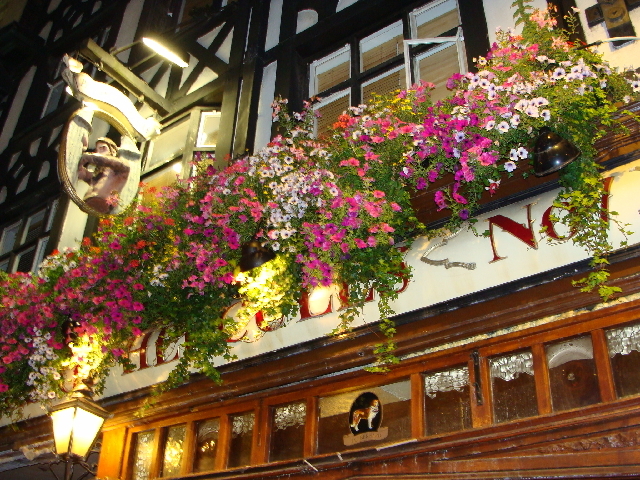 In the warmer months, the front of the alehouse is adorned with an impressive array of flowers and hanging baskets. Here are Ed, Sachin and Jeff sipping half pints of Harvey's Best Bitter and some fine UK golden ales inside the welcoming Cross Keys. 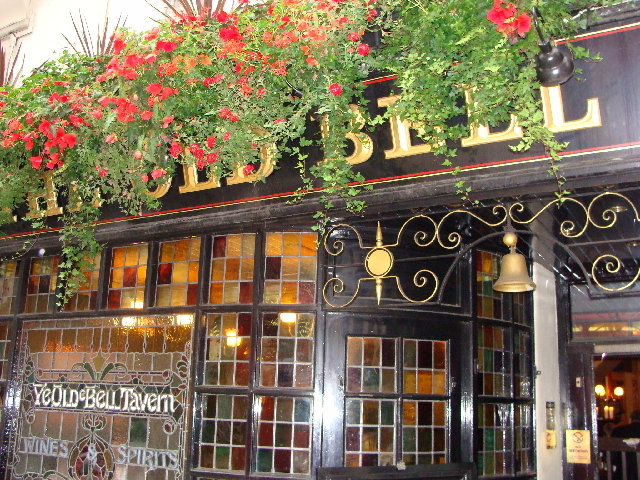 The pub can be found just a few blocks north of the Covent Garden tube station. 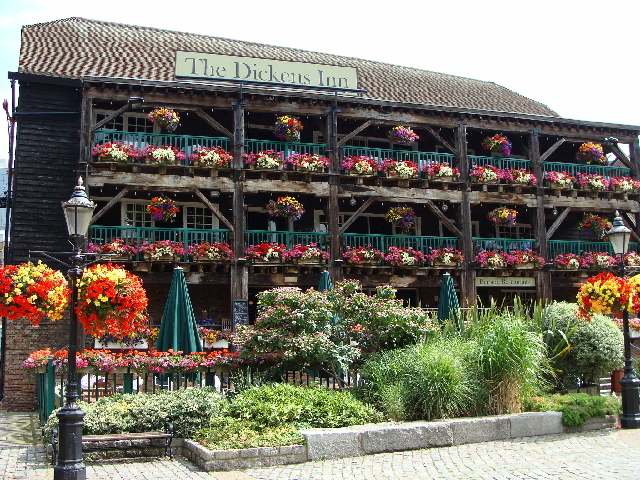 Dickens is a touristy, riverside pub that's quite attractive. There are separate ordering areas for pub fare and pizza. 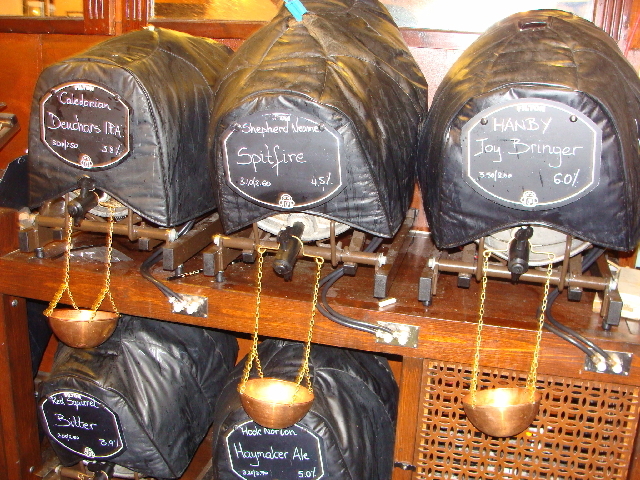 We visited on a hot summer day, and a couple of the four cask ales we tried were a little off. Ask for a sample before ordering a full pint. 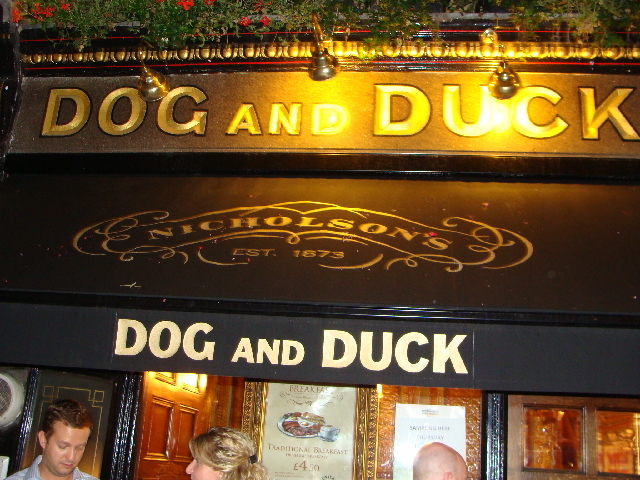 Found in bustling Soho, Dog and Duck is a traditional, tiled pub among the frenetic nightspots of the area. 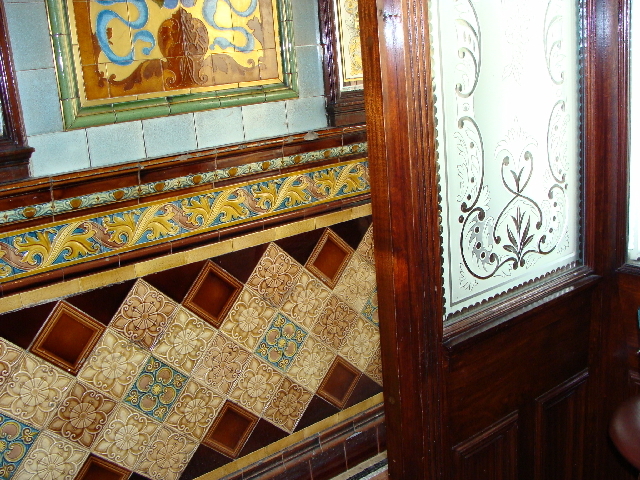 Grab a London Pride or Tim Taylor's ale and have a gander at the attractive glazed tilework. 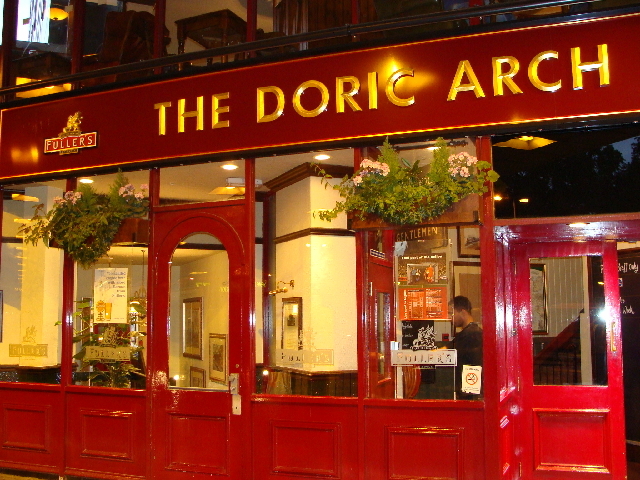 Located near busy Euston station, Doric Arch sports a railway theme and offers an excellent selection of the best cask ales available in the city. Also, for the best chicken you've ever tasted, be sure to visit Nando's next door. Interesting real ales served in pewter mugs, an excellent cheese platter, and cozy back snugs highlight this delightful London pub. Six sleeping rooms are located upstairs. 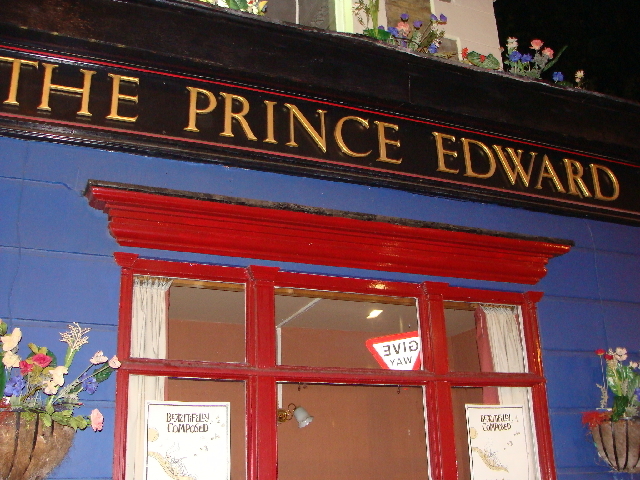 There are two cozy rooms in this friendly pub, and the owner takes great pride in his excellent range of real ales. Another gorgeous example of a Wells and Youngs London pub, The Hope features attractive mirrors, glazed tilework, and some extremely hardy and traditional English pub menu items. 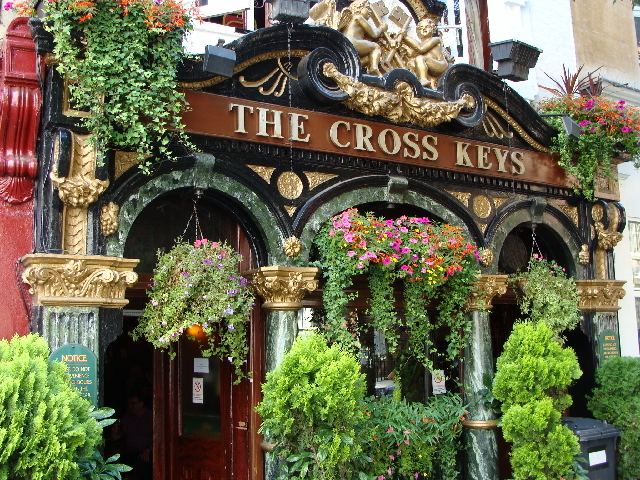 This is a beautiful example of one of the best London pubs in the UK's Wetherspoon's chain. Wetherspoons is known for its tasty and affordable food items and an excellent range of real ales from all over the island. This attractive Young's pub is famous for its glass "snob screens" at the bar and old photos of actors from the London stage of bygone days. 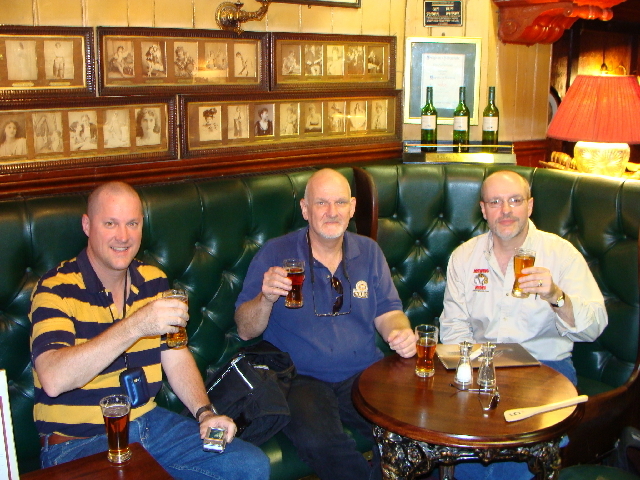 Above: Jeff, Ed and Owen enjoy half pints of the excellent Special London Ale on cask. 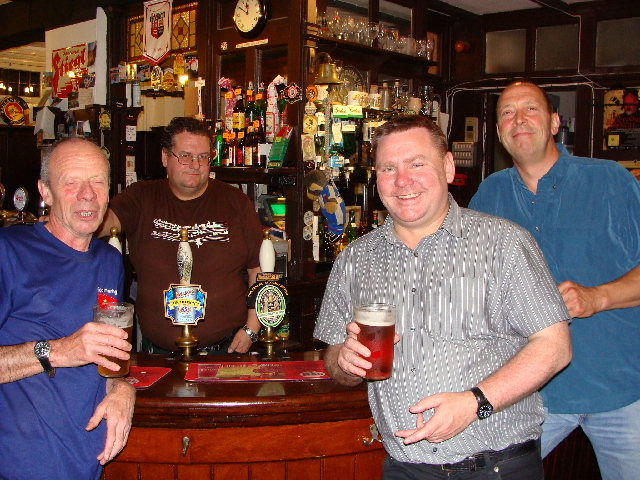 Pictured above are the guys of Brentford's wonderful Magpie & Crown. 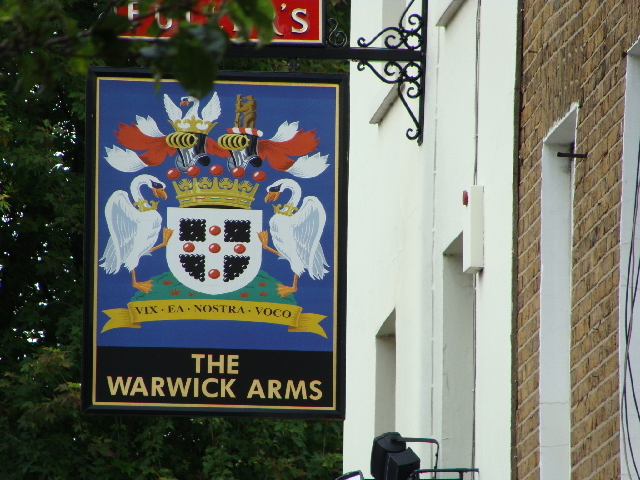 Out near Kew Gardens, there is no better pub in the area in which to have a lively conversation and an excellent example of a well-kept, rare real ale. 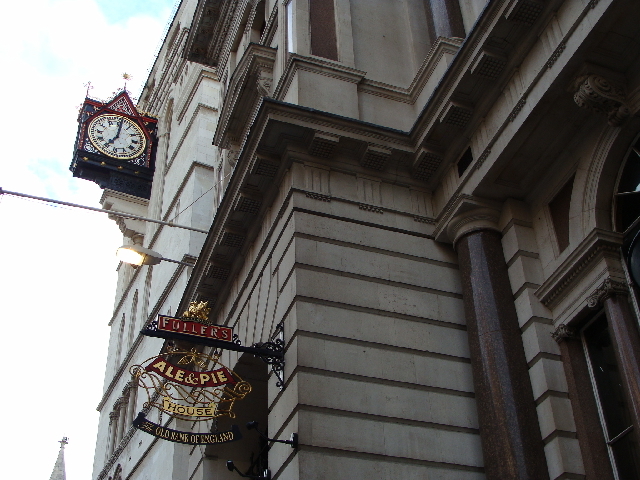 Located in one of London's financial districts, this is one of Fuller's most attractive and formal pubs. 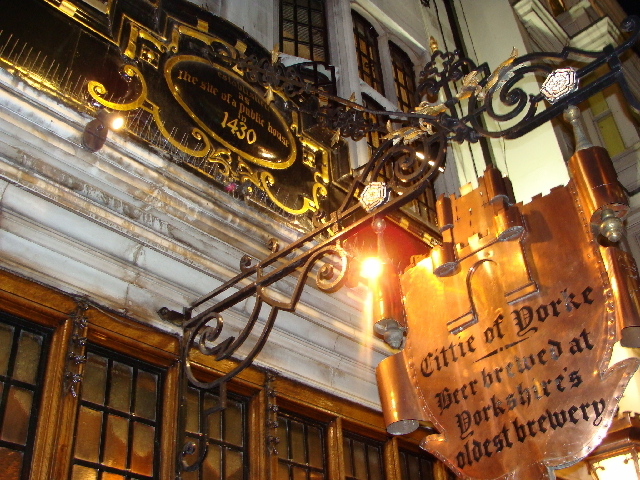 Being in a business area, be aware that many of the pubs in this part of the city do not open on the weekends. This pub was once frequented by printers from the many print houses located on Fleet Street in the last century The pub is filled with history and serves up four or more cask ales. A bit hard to find down a small alley, Ye Olde Mitre is very much worth the effort. 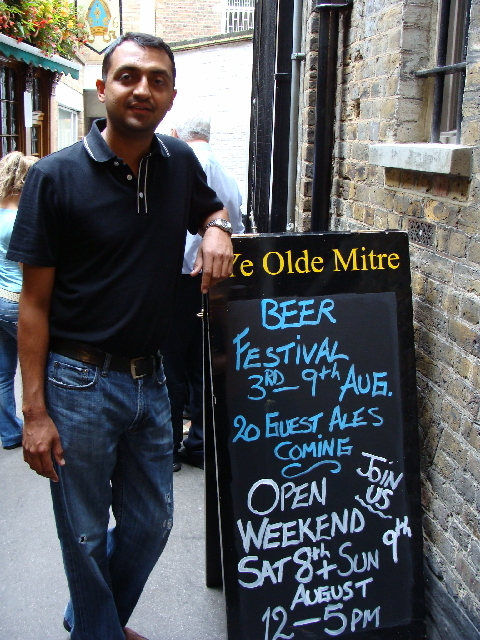 In the photo above, Sachin poses alongside the sign announcing that the pub would be offering 20+ guest ales over the week of the Great British Beer Festival. Located in busy, noisy Soho, Pillars of Hercules is the only place in the area to sample a pint from the excellent Bateman's Brewery of Wainfleet, Lincolnshire. Be sure to try the XXXB ale on cask. 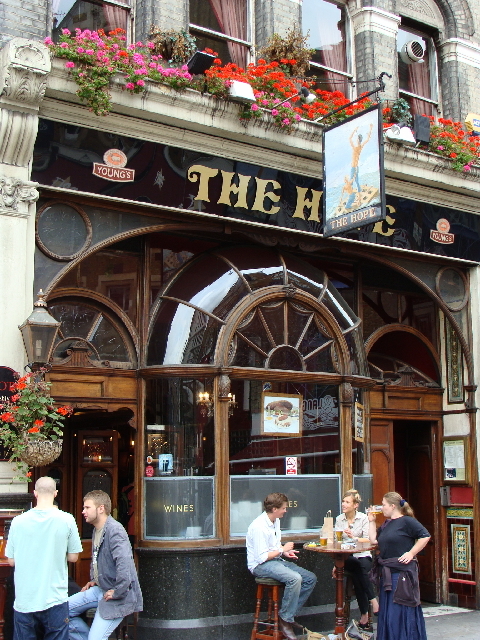 One of the few pubs in London that offers Badger real ales from the Hall & Woodhouse Brewery. Worth seeking out. 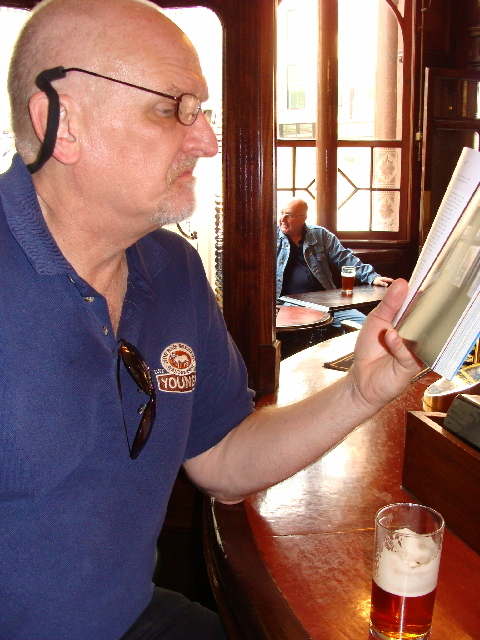 Here's Ed reading up on the history of the beautiful Princess Louise pub in Holborn, London. This pub was closed for a short time for a recent makeover by Samuel Smith's. The Princess Louise possesses one of the most gorgeous interiors of any London pub - even the men's toilet has a national preservation order. Check out the sample of luxurious tilework shown above. 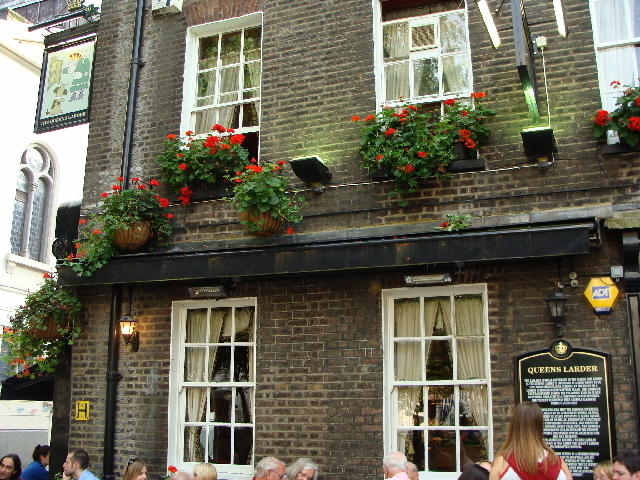 Located on a somewhat quiet corner near Russell Square, this pub is packed with humble history, and offers some interesting seasonal ales (including Old Speckled Hen) on cask. 93 Linkfield Road, Isleworth, Middx. 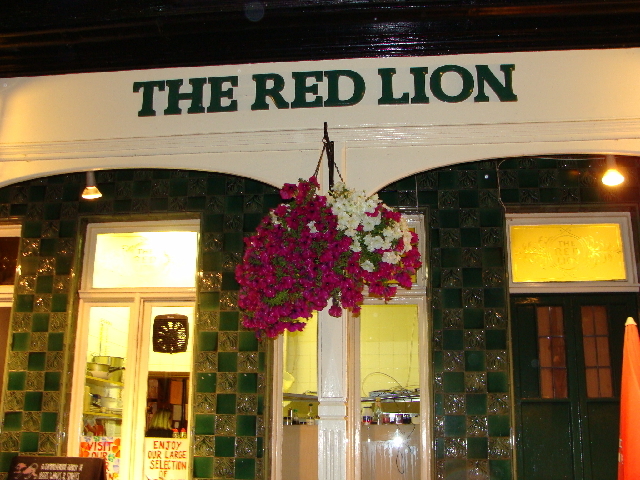 The Red Lion is a local institution in the suburb of Isleworth near Brentford. 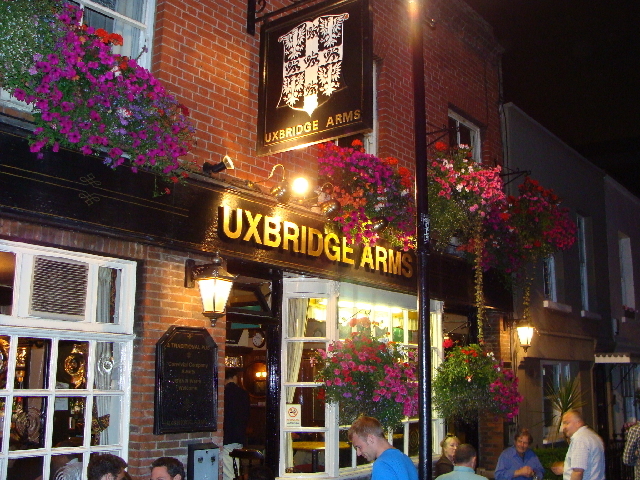 Locals pack the place on a regular basis to sample the fine cask ales, chat, and compete on trivia nights. This pub has won awards for local CAMRA Pub of the Year, but is quite isolated and difficult to find. 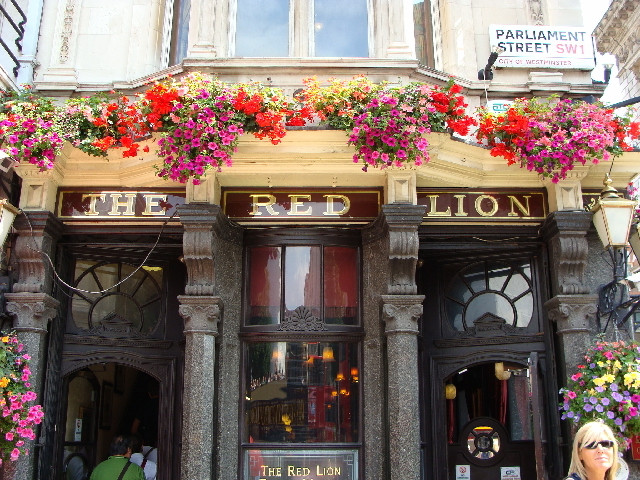 One of the few really traditional, non touristy pubs in a very touristy area of London, this Red Lion offers some very well kept cask ales and a fine upstairs restaurant. This small, busy pub's interior is adorned with old film posters and political cartoons from many years ago. The nice range of cask ales really makes this place worth seeking out. Be sure to pet the pub cat. 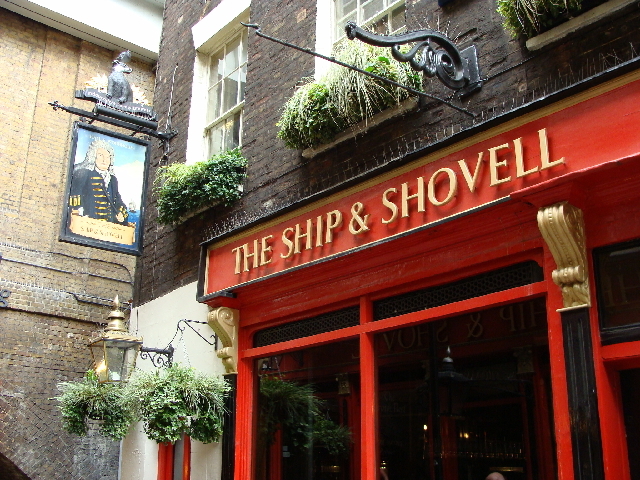 The lovely Ship & Shovell offers a quiet real ale oasis just a few steps from busy Trafalgar Square and actually has two sections that face each other across the narrow pedestrian street. 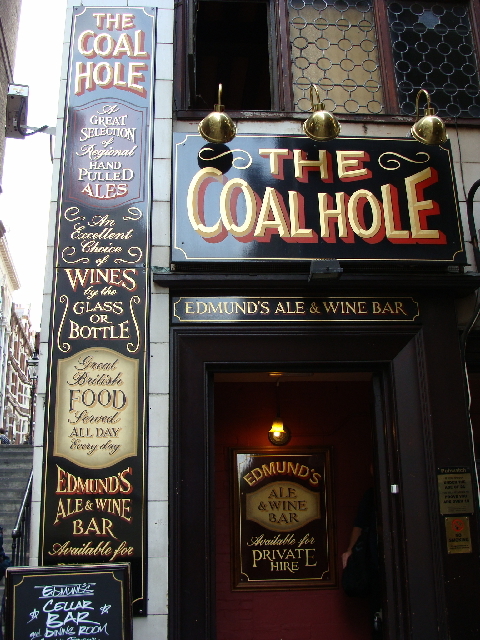 This traditional pub for locals offers a comfortable interior and traditional real ales from regional breweries. This old pub got a makeover in the early part of the 1900s and offers lots of small, individual sitting rooms, dark wood paneling, low doorways (mind your head), and admirable real ales from popular breweries. 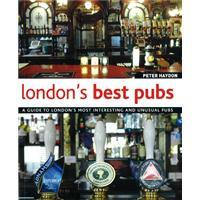 Don't think of visiting London without a good pub guidebook. Rudgate, Ruby Mild (York, North Yorkshire) - Our sample had a slightly vinous, licorice aroma with notes of fruit and a hint of latex. Gorgeous ruby color and beautiful hop profile from Challenger, Cascade and Styrian Goldings. Surrey Hills, Ranmore Ale (Guildford, Surrey) - Quite golden in color for an English Bitter style ale - very clear with a complex, spicy bitterness and subtle hop aroma. Southport, Golden Sands (Southport, Merseyside) - Fruity and hoppy with a very pleasing sweet malt and spicy/citrusy hop balance. Light gold in color. Dark Star, American Pale Ale (Ansty, West Sussex) - Golden in color with citrusy hop notes alongside a floral, lychee-like fruit note. There was also a slight smoky phenol hint in the firkin that we sampled. West Berkshire, Dr Hexter's Healer (Thatcham, Berkshire) - Copper in color with fruity, caramely, toffee, burnt raisin bread malt notes. Hops are spicy in flavor. Contains pale, Maris Otter, crystal and chocolate malts along with Bramling Cross, First Gold and UK Cascade hops. Loaded with character! Nethergate, Umbel Magna (Pentlow, Essex) - Strong cedar notes meld with pine resin hints and cracked coriander and cereal/wheat character. Challenger and Fuggle make up the 27 IBU hop bill. Dark brown in color with red highlights and a herbal, smoky note. Oakham, Attila (Cambridgshire) - This beer was not tasted. Gold - Titanic, Stout (Stoke-on-Trent, Staffordshire) - Roasty, biscuity stout with beautiful burnt notes. Fuggles and Northdown hops provide a fresh, herbal hop flavor.